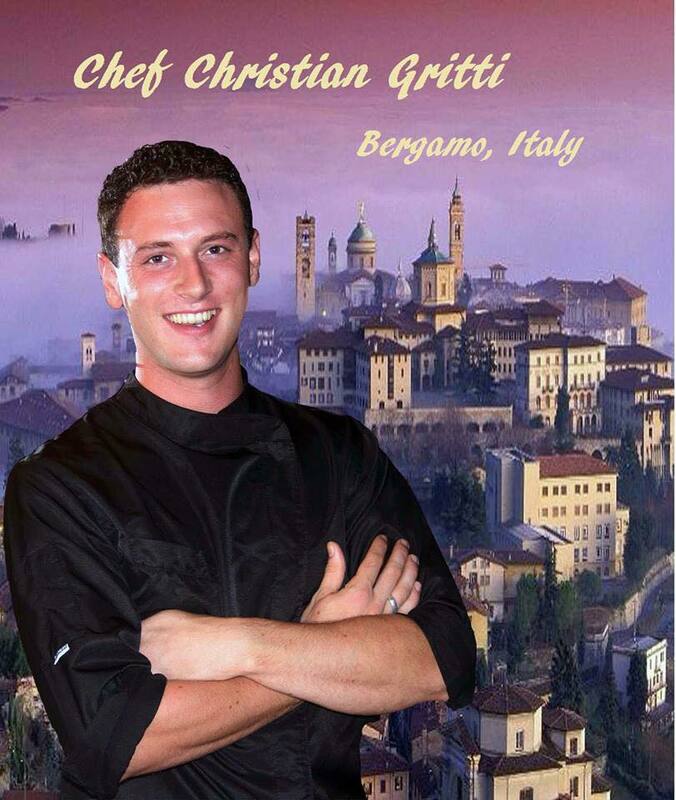 Chef Christian Gritti was born, raised and trained in Bergamo, Italy. Bergamo is a beautiful city in the foothills of the Italian Alps. Christian attended one of Italy’s most long standing culinary schools in San Pellegrino, Italy, where he graduated top of his class. His family has owned restaurants in Italy since 1896, making him the fifth generation in his family to carry on the tradition of preparing food for people for over a hundred and twenty years!!! The chef has worked at a variety of Italian restaurants in Northern Italy from his hometown all the way to the Italian Riviera. Chef Christian has experience working at Michelin star rated restaurants and has also worked in San Diego at one of the most famous Italian restaurant there called Buona Forchetta. He is a traditional Northern Italian Chef, this is not Olive Garden. The chef enjoys creating dishes that give the palate a full sensation of elements such as mixing sweet with salty and soft with crunchy qualities. All of his pastas that he serves at his trattoria are handmade fresh! You will surely notice the difference in flavor between the dry pasta you can buy at any grocery store, and the fresh pasta he makes at Pasta y Basta. Dry pasta consists of just flour and water while fresh pasta has more ingredients (flour, egg, white wine, and salt) which surely are more flavorful. At his trattoria he features a traditional Italian menu; antipasti (appetizers), primi (pasta or risotto dish), secondi (meat or seafood dish), dolci (dessert) and a whole entire list of pizza and calzone. The chef also makes his own Limoncello, and it will always be offered after every meal, as this is an Italian custom. The wine he serves is from an Italian venter in the Guadalupe Valley, Villa Montefiori and also some that have been imported straight from Italy. Don’t miss our daily wine tasting menu of 4 courses paired with wine. On occasion he will have 4 or 5 course wine pairing dinners that are not to be missed. We have imported a pizza oven from Europe, the chef grew up making pizza as his father owns a pizza restaurant in his home town. Pasta y Basta has adapted to embrace the area and the culture we are a part of. The decorations in the restaurant are all typical to the boulevard artesanal we are located on! Pasta y Basta was opened in the summer of 2015 a little over a year after the chef moved from Italy to marry his wife, here in Rosarito. It is the only truly authentic Italian restaurant in Rosarito and more specifically a truly authentic Northern Italian restaurant because the chef has been true to his heritage. The chef’s goal in opening his restaurant was to “Bring a Taste of Italy to Baja California” and he surely has! We hope you feel like family in our cozy, humble location! We are so glad you are here! Grazie and BuonAppetito!! !